See that clasp there above? Can you guess what it opens? Better yet, do you know what the item is? Here’s a clue: it’s something I’ve always wanted! Yes, it’s got something to do with food and it opens up to something way cooler than the exterior. It’s a beautiful object that’s very useful and one I’d definitely be taking out to the park or the beach. Have you guessed it yet? It’s pretty simple ya? Ta-dah!!! 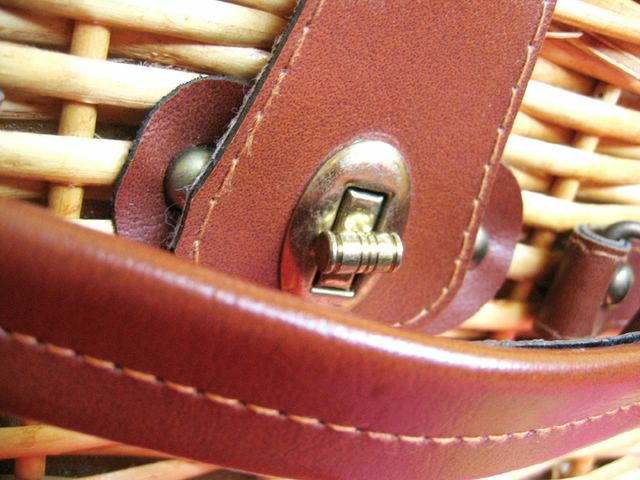 If you guessed a picnic basket, you’re right! Wait, that’s not it…. The best part is that this basket belongs to me! I’m so so so excited. It’s actually Dot’s birthday present to me. Aww… I’m so touched – she knew that I’ve been looking for one and the dear girl actually got one for me. Thank you so much Dot! I love this present to bits. You all should have seen the look on my face. I was estatic when Dot handed the basket to me and said it was mine. Check it out!!! I think Mr. Bean has the same basket. Remember that episode where he went for a picnic with his brown bear and he had to chase away the bees? haha. Lovely, this is just so lovely! I really just want to go picnicking right now! Imagine bringing this basket out, finding myself a nice spot under a tree, and opening it, and having a nice and homely picnic on a cool Sunday morning. ahhh…. I adore the checkered interior I tell you. It’s so old school! Man, this picnic basket’s like an antique. And it sure is one helluva present. It’s something I’d treasure and keep for a long long time. Maybe it could be an heirloom… HAHA. Pass it down to my children in the distant future. heh. okay, I think I’ve gone bonkers. oh.my.god! 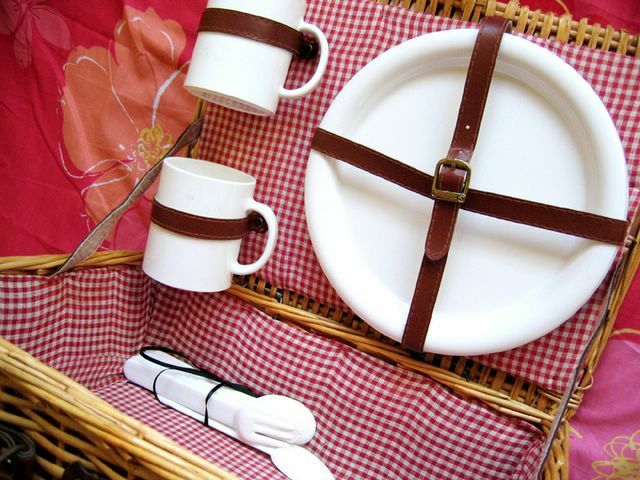 my bf and i have been looking for a picnic basket for some time now. this is just perfect. i adore the checkered design too!! oh.my.god.oh.my.god. i’m just as excited as you are at the sight of this basket. hehe. 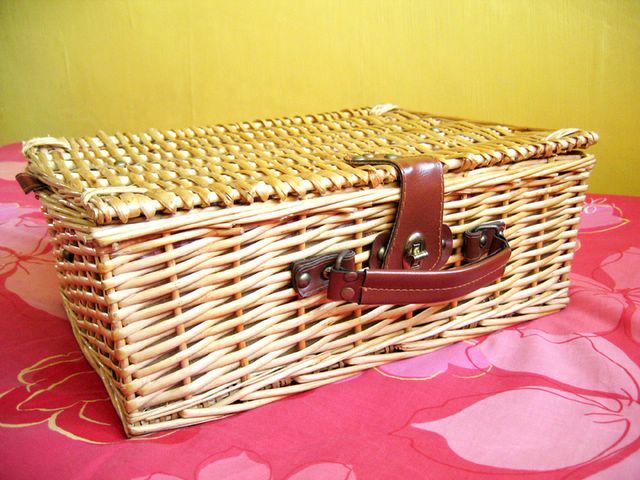 wow.. nice picnic basket.. haha.. the ice cream from marina is also very de cool.. hey.. is yr birthday on the 29th of july?? if it is then it’s the same as me.. haha.. cool man..
Ooh, nice basket – I hope you get to use it soon! And I love that Mr. Bean episode!! Hahahaha… I remember that particular episode as well. Especially when he trapped one of those bees in his juice bottle. Hilarious. Lavender cupcaker: hey girl, yea, i agree. can just go east coast park or botanic gardens on a bright sunny day! mariya: i think so too! i fell in love with this basket the moment my friend handed it to me. I was speechless i tell ya. Cheryl: hey hey, yes i am dying to use it. I love Mr. Bean! he’s so darn hilarous. trish: hmm, i’m not really sure actually. hershey’s doesn’t really have a boutique. why not try other brands? like Valrhona?